With Ciaran Clark still out injured we’ll have to wait and see if Chancel Mbemba gets another start today at Hillsborough, after he was a surprise starter against Burton Albion on Wednesday night and played very well in the 1-0 win. Mbemba was the first choice center-back last season, but since Rafa has come in the 34 times capped DR Congo International has made very few appearances for the Magpies and it even seems he could be sold in the summer. But Rafa has come out and praised the former Anderlecht defender for both his form and his attitude – and it reflects very well on Chancel that he has remained upbeat and positive, even though he hasn’t made the squad a lot of times this season. We have to admit that we think Rafa will sell Chancel Mbemba this summer and probably try to bring in Hull City’s Harry Maguire, but a number of Newcastle fans will not be happy with that. Chancel played really well last season for us and is a good player and a great guy. It’s not surprising he is a big favorite with the Newcastle fans. Possibility of both Hanley and Mbemba starting but may use the latter as a sub to protect against potential injury. Hayden could possibly come in with Diame moving forward, but I would rather he not. Rafa will probably be thinking to control the game and counter, I would prefer to see Atsu start but he is great coming on against tired legs. I also imagine that if Ritchie starts he will be subbed as he has played alot throughout the season. Must be destroying your soul that Rafa is leading us back to the premier league. The job he was brought in to do. Your becoming this seasons toonbrother in this obsession than everything about him is wrong . The last time you chose to rant on like this I politely asked you who, given the same circumstances this time last year would you have preferred to have been given the job of sorting out what was a complete shambles of a club from top to bottom ? I believe I am still waiting to hear your answer . I am all ears …. one fine day … I answered that question when posed by Jail previously. Basically my response was that I couldn’t put up a name, because I am too far removed from the scene to be that specific about who may have been available etc. But, philosophically, I was totally opposed to an overrated, overpaid egomaniac with a CV which includes failures in his last three postions, two of them absolute humiliations. A bit like the return of Keegan. I hope Brighton win the league under Hughton, and I don’t give a ferk what any of you think about that. Rafa would be far more secure playing 4141 with Mbemba as the DM. WWSBRD, you probably mean to say scraping, not scrapping, but I’ll excuse you because clearly you are not here for any meaningful intellectual input. Do you live in Benwell? Mbemba should play as the DM, i’d prefer him over Jack he’s quicker,stronger,better with the ball, better defender and he has played there for Congo. 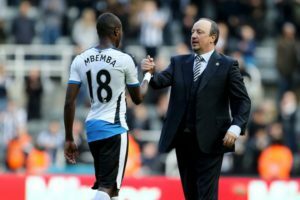 Mbemba is still young so would be able to adapt no doubt worth a try Rafa. Not a bad shout on murphy . A real toss up between a solid battler and gayle’s pace if we are looking to hit them on the break . Haha bless ya claiming intellectual input after spouting fishing bile. Do u live under a bridge? WWSBRD – I feel I should respond, but I can’t really make any sense of that..so I’ll give you this round on points. You have defeated me by going to a level below my comprehension. Fair play to you there laddie. Over-rated Frenchman – suggest you go and support Brighton instead. After all they have a popular ex-Newcastle manager and …err…..that’s it! Your comments about Rafa just confirm how out of touch you are. He and his family have shown themselves to be caring and concerned – for example about charity, disabled fans, youngsters etc. I like how he almost never comes up with excuses if we lose or play badly. As for Mbemba – he played well on Wednesday but against a pretty toothless Burton attack. I would still have Clark in if he was fit. PS I don’t care if us or Brighton win the league as long as we finish in the top two. PPS What a WUM you are! WTF!! We spent 10 million + on agent fees last year !!!! If that figure of 10 million is accurate then it needs some explanation. magpie6699 – It seems that if you are not slobbering on FSW’s espadrilles you are a WUM on this blog. So be it. But I do agree it’s great when Montsie donates the haute couture dresses she’s sick of wearing to charity. What a gal. mindshaft@19 – you are a WUM and a mackem and a traitor to the glorious regime to disseminate such information. I tell you what hibbitt….Ashely, Charnley, Carr, and the scum they engage with and employ, plus the mindless rabble like yourself who lap up everything they serve up, makes me wish I was a mackem sometimes. I don’t really know what that’s like, but it couldn’t be worse than being a NUFC supporter 2017 style. This is not a place I am proud to be, I can promise you that. £10 million on agent fees sounds about right. The club has released/sold a lot of players, and recruited something like 12 new players. That is a lot of transfer traffic. There will be too much pressure on our players today with Brighton winning. Expect very few chances a lot of defending and back and sideways football. Hopefully we’ll catch them on the break. Overall, we had more transfer business than Arsenal, with similar agent fees. The club must have used agents to help drive up the fees for Wijnaldum & Sissoko et al. But – delighted to see Mbemba get his chance and play well. What’s all this ” haute couture dresses” stuff. I know nowt about stuff like that -luckily the Mrs was at hand to explain it all. I suppose it’s the world we live in now. Gone for pace up front to hit them on the break. Need to win, dead simple. Just keep winning and the title is ours.